Past presidents George H.W. 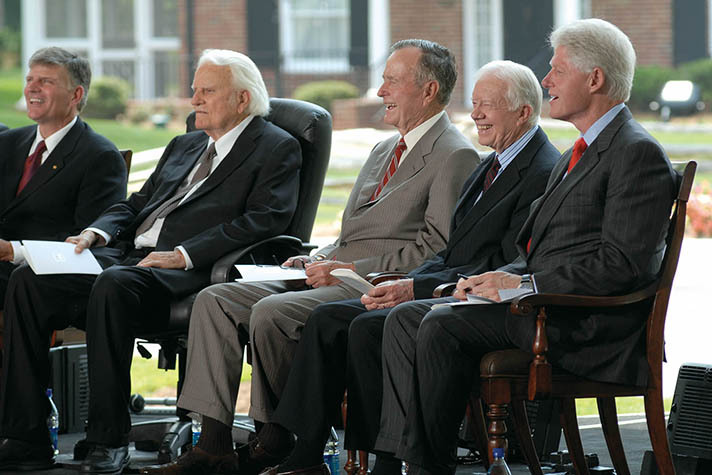 Bush, Jimmy Carter and Bill Clinton came to the dedication of the Billy Graham Library in May 2007. I believe this country is facing today one of the most serious and crucial elections in history. I do not believe there has ever been a time—even in the days prior to the Civil War—that we as Americans have gone to the polls with greater issues than those at stake in the coming presidential election. In my travels abroad I have discovered that Americans are not as popular as they used to be. Nor am I alone in my observation. I have talked with others who have traveled even more widely than I. They agree, too, that our effort to buy friendships all over the world with dollar bills is having a reverse effect. This is only logical. In our foreign policy we have forgotten that men are spiritual and moral creatures. Hence, when we make a materialistic approach, we get only a materialistic answer. About the only thanks we get for such help is a request for more. Unless we change this policy, we will not only lose faith in our sense of values, but we will drag the whole world down with us. A nation must first recognize God. Then I believe those individuals in the nation must repent of sin and receive Christ as personal Savior. I believe, too, that the church must be revived. The reason the Western world is failing now, in my opinion, is because the church has failed. If the church had been aggressive and dynamic and strong, and members of the church had been living wholly sanctified, separated lives, producing the fruit of the Spirit, we would not be in the economic mess that we are in today. The whole key to a successful democratic world, in my opinion, is the church. I think it is the duty of every individual Christian at election time to study the issues and candidates and then go to the polls and vote. Moreover, I agree with Congressman O.K. Armstrong of Missouri, who said that it is the duty of Christian men to offer themselves for public office. One reason we have such bad political leaders is because in some places only the bad ones offer themselves for office. There are many places in which Christian men could get the vote if they offered themselves. Daniel lived in one of the most heathen countries in the world, but he was prime minister under seven kings in two empires. We need more Daniels today. If I were a pastor of a church I believe I would … explain to my people where each candidate stood morally, spiritually and in relation to the church. I feel that we are going to have to meet our political obligations as Christians and make our voice known if America is to be preserved with the type of Christian heritage that has given us the liberties we now enjoy. For unless America does turn back to God, repent of its sin and experience a spiritual revival, we will fail as a nation. I believe God honors leaders in high places who honor Him. That, I am convinced, is taught in the Scriptures. God is a sovereign God. If He is honored as God and His divine providence is recognized in the affairs of a nation, I believe there is a certain amount of honoring received in return from Him. And if a nation persistently fails to honor God, we have no better illustration of the end of that nation than the Biblical record of the once great nation of Israel. It’s the easiest thing in the world for us as Christians to think of national and world politics as something involving men and women of the world. That’s where we fail. Our job as Christians is to make the impact of Christ felt in every phase of life—religious, social, economic and political. But we must not do it in our own strength or wisdom. We can only do it as we surrender ourselves completely to God—allowing Him to work in us.